M. Monnerville Laboratoire de Physique des Lasers, Atomes et Molécules, UMR 8523 du CNRS, Centre d’Études et de Recherches Lasers et Applications, Université Lille I, Bat. P5, 59655 Villeneuve d’Ascq Cedex, France. P. Larregaray Institut des Sciences Moléculaires, Université Bordeaux 1, 351 Cours de la Libération, 33405 Talence Cedex, France. F. Dayou Laboratoire d’Etude du Rayonnement et de la Matière en Astrophysique, UMR 8112 du CNRS, Observatoire de Paris-Meudon, Université Pierre et Marie Curie, 92195 Meudon Cedex, France. A. Rivero-Santamaría Instituto Superior de Tecnologías y Ciencias Aplicadas, Habana AP 6163, Cuba & Laboratoire de Physique des Lasers, Atomes et Molécules, UMR 8523 du CNRS, Centre d’Études et de Recherches Lasers et Applications, Université Lille I, Bat. P5, 59655 Villeneuve d’Ascq Cedex, France. The SiO molecule is the most widespread silicon-bearing molecule in the interstellar medium. Its largest abundances are found in regions of star formation, whereas its abundance is very low in quiescent cold dark clouds. The major source of SiO in the “shock” regions of the interstellar medium is the reaction Si(3P)+OH(X2Π) → SiO(X1Σ+) + H(2S) , however there is not experimental data available for it. Here we show and compare with quasi-classical trajectory method (QCT), the results of Mean Potencial Phase Space Theory (MPPST) calculations of integral cross section (ICS), thermal rate constant (k(T)) and ro-vibrational distributions, using the numerical approach (n-MPPST) and the analytical ones: the traditional framework (a1-MPPST) and a new feature suggested by our group (a2-MPPST). The ICS (and consequently the other observables) values depend strongly on the fitted potential in both reaction channels, so in order to develop more precise calculations we divided the fit process in two main regions depending on the collision energy. The obtained ICS values shows that the a2-MPPST has a greater agreement than a1-MPST and n-MPPST with QCT. We expect that subsequent refinements of MPPST like the showed on this work could lead to an alternative to more sophisticated and expensive calculations, and also be a valuable first approach to the triatomic colisions dynamics. PANADÉS-BARRUETA, R. L. et al. 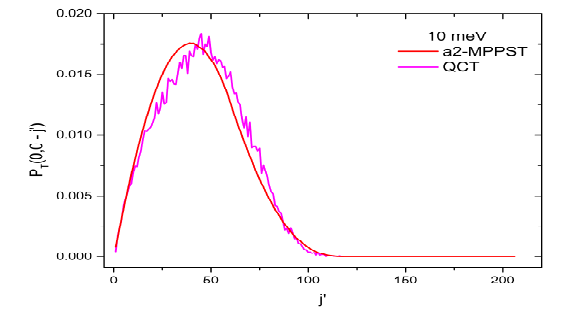 Mean Potential Phase Space Theory Study of the Si(3P)+OH(X2Π)→ SiO(X1Σ+)+H(2S) Reaction. Revista Cubana de Física, [S.l. ], v. 33, n. 2, p. 102-117, dec. 2016. ISSN 2224-7939. Available at: <http://revistacubanadefisica.org/index.php/rcf/article/view/65>. Date accessed: 19 apr. 2019.